It is difficult to speak about my service with Patriarch Pavle without sounding like I am boasting. Knowing the Patriarch was everyone’s privilege, not just of those who served with him or helped him in his administrative duties. After all, he was a very simple person; one could often see him walking through the streets of Belgrade or riding a city tram. 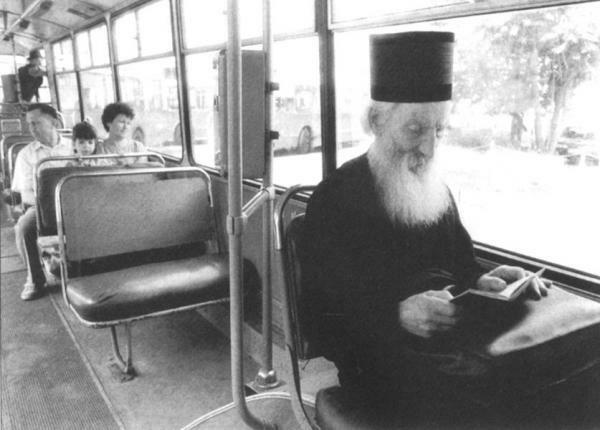 Those whose duty it was to accompany him sometimes grew indignant: “Your Holiness, you have a car after all!” Whenever possible, however, he preferred to use public transport. My service – as it happens, for which I am grateful to God – was always connected with His Holiness. I served with Patriarch Pavle for nineteen years, until his very last day. During his primacy I held several positions: I was a teacher in the department of canon law at the Theological Faculty at the University of Belgrade; I taught homiletics and Russian at seminary (I graduated from the Moscow Theological Academy, so I had learned Russian); for nine years I was in charge of the Patriarchal Library; and for ten years I was secretary of the ecclesiastical court. I was also involved in the development of the Patriarchate’s information system by networking computers and purchasing and installing programs needed by the church administration. His Holiness did not bless me to be ordained to the priesthood immediately. I served in the rank of deacon for fourteen years, which was quite normal with him. There was never any hurry in matters of ordination; he waited for the right time for a person. Generally speaking, my ideas about what I should do with my life did not always come about. For example, after working in the Patriarchal Library I defended my doctoral dissertation in canon law and seriously contemplated devoting myself to scholarship. I requested a release from my administrative duties, but instead the Holy Synod appointed me director of administration at the Patriarchate. Naturally, my studies were sidelined because I had to deal with administrative affairs on a daily basis. The Patriarch later blessed my ordination to the priesthood, appointing me for a short time as rector of the Church of St. Sava that was under construction. The Patriarch spent his last years in the Military Hospital, but God gave us all the strength and ability to continue to conduct administrative affairs smoothly, so it did not feel as though His Holiness were not among us. Serving with him was a precious gift; we saw and participated in much that was extraordinary. We saw the boundless modesty of the life of His Holiness, even though he held the highest office in our Church. He took great care that no one would be offended, that no one would feel any burden associated with the Church. The Patriarch’s diet was very modest. He did not eat breakfast; normally he only drank a cup of tea and ate a piece of bread. He normally cooked lunch for himself, making a very small portion of vegetables: a few potatoes and some herbs he collected around the Patriarchate. He almost never had dinner. He lived this way for years, and we were simply astonished at how he managed to move about and how his organism could bear not eating anything. But it was clear that he was a man of God, drawing from the Liturgy his strength, his cheerful spirit, and his understanding of all people. He understood everyone perfectly, from the small child on the street who came and tugged at his sleeve to the presidents of various nations. 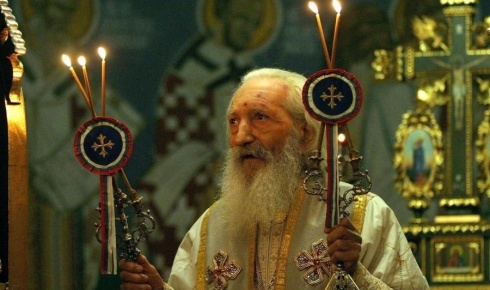 Patriarch Pavle served the Liturgy daily. The only exceptions were days when he was travelling or ill. It was difficult to keep up with him, because he rose very early, at 4:00 am, and served the Liturgy in the Patriarchate at 5:00. So it was when he was eighty, and so it remained when His Holiness turned ninety. He said his cell rule and then went to church. We served with him and normally did not get much sleep because, after completing the administrative affairs that often lasted until quite late, not much time was left for sleep. It should be said that he did not ask any of us to come to these Liturgies: our work began at 8:00, and we could simply have come to the office at that time. But that would have been somewhat awkward: we are sleeping, but His Holiness is serving. So we came and served with him. I did not know where to take him. We went into one of the churches in Danilov Monastery and, around 5:00 am, found some monks preparing for the service. They were very surprised to see us! They found vestments for us, Patriarch Pavle put on priestly vestments, and served as a simple priest. I think those monks themselves found it interesting that the Serbian Patriarch was serving in their church! He preached daily; many of his sermons and talks have been transcribed and published. He dedicated a great deal of time to fellowship. The Patriarch’s working day was as follows: Liturgy, tea, and receiving visitors. He was a monk, but he did not have an exclusively monastic life: he did not shut himself off from people, but tried to receive everyone who came to him; he wanted people to come and talk with him. To some he simply listened; to others, as the need arose, he gave advice. After the evening service he normally received various pious women, conversing with them in an informal setting. Even priests rarely came to him at this time, since they knew that they could meet with the Patriarch at any time, while simple people could use this specific time to see him. It sometimes happened that these women attempted to show him that they were in contact with the world above. One of them once related that St. Petka – Paraskeva – had appeared to her the night before and told her something special. Patriarch Pavle gave her to understand that one should not engage in such things, but simply behave like a normal person. That he was an extraordinary man of his times was also shown by the day of his funeral. Nearly one million people filled the streets of Belgrade and another 600,000 came to our central cathedral to kiss the Patriarch’s hand one last time. His coffin remained open for six days, and nothing happened to it. There were people who said: “Perhaps one shouldn’t kiss his hand. It’s good that you so revere the Patriarch, but there is an epidemic going around and one needs to be careful.” Some sort of flu epidemic was in fact going around, but ultimately nothing bad happened. People stood in line for up to nine hours, but no one ill-treated anyone else; everyone waited patiently to kiss the hand of His Holiness one final time. 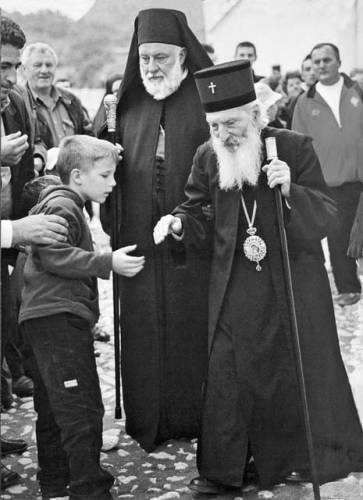 We, who had personally known the Patriarch for many years, were amazed to find that the people so revered him. Of course, we knew that people turned to him for advice and that they tried to attend his Liturgies, but we had not anticipated that one million people would fill the streets to accompany his coffin and that another 600,000 would come to say farewell to him in church. Time will likely show that he was an extraordinary man of his times; we shall see what happens next. We hope, of course, that the Lord will make him a saint, but it is too early to speak of this. For the time being, we are taking careful note of what goes on at his grave and what sort of healings are taking place – but we will not say too much about this, since he has only just reposed.